Chennai: Continuing his giant-killing spree, Slovakian qualifier Aljaz Bedene knocked out third seed and world number 15 Roberto Bautista Agut to reach his maiden ATP tour singles final, here on Saturday. The 25-year-old Bedene, ranked as low as 156, shocked his Spaniard opponent 3-6 6-3 7-6 (8) in a marathon and intense semifinal that lasted two hours and 42 minutes. Beden has become first qualifier in the 20-year history of Chennai Open to reach the summit clash. It has been a dream run in the USD 450,000 tournament for the Slovakian as he had also upset second seed Feliciano Lopez and fifth seed Guillermo Garcia-Lopez in previous rounds. "I have worked very hard and it paid today. I wanted to win the semi-final, having lost on two occasions. I am happy with the way I won against Agut today in our first meeting," an elated Beden said after the match. There was not much to separate the two players. 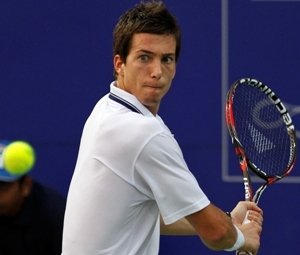 Bedene kept his cool on the big points and kept Agut under pressure despite losing the first set.